Gini Koch returns to How They Do It with what might be the best post on how to find your voice I've seen. I just love her exercises and suggestions here, and as someone who's tried something I'd never done before and found out that was my niche, I can attest to what she says here. You never know until you try. Gini is the author of the funny sci fi series of books including Touched by an Alien, Alien Tango, and the new release, Alien in the Family. There are a lot of definitions of author’s voice out there, and I’m sure they’re all correct. But I view voice as how your writing sounds when it’s read by a reader, either in their heads or aloud. Every writer has a voice, and really good writers have distinct voices. It involves not only their structural decisions--POV, 1st or 3rd, genre, etc.--but how they choose to use the words they write. I write under several pen names, in part because I’m writing in very different genres, but in bigger part because their writer’s voices sound different from each other. So, how do I do it? And, more importantly, how do YOU do it? First off, I’m not a proponent of the “copy out a best selling/classic author’s books in longhand to get the feel of it” school of thought. You’ll get a great feeling for that author’s voice, but knock-offs don’t sell as well, or for as much, at the originals. I’m also not a proponent of the idea that there’s only one right way to do anything, particularly writing. So what works for me might not work for you. The easiest way I’ve found to learn to capture your author’s voice or voices, is to try some simple writing exercises. Take a prompt--such as, an older woman stands at the top of a set of stairs, staring down at a man on the floor below her--and now write a short scene using that as inspiration. Whatever you write first is probably the voice and genre you’re most comfortable with. It doesn’t mean it’s the right voice or genre for you to write in, by the way, but it’s the one/s you’re used to. Now, do another scene, same prompt, but write it completely differently. If your first version was a literary-type scene, make this one a murder mystery. Then do it again as a romance. And again and again, trying out each genre you’re familiar with as a reader. Then switch and write another scene, again using the same prompt, but this time, change your point of view. If you wrote the others in first person, use third, or vice versa. Try different levels of narration depth. Now, do it all again, this time being serious if you were funny before, funny if you were serious. Dark versus light, wordy versus spare prose, long sentences versus short, and so on. Write that scene with as many differentiations in what you’re writing, and what happens in that scene, as possible. If you’re hoping to write in more than one genre or under more than one name, you’ll want to focus on each of these sounding very different. If you’re planning to write under one name and one genre only, you’ll want to focus on them being different while still sounding like one person wrote them. When you’re done, let it sit for at least a day; longer would be a good idea, so you have distance from it. While you’re letting them sit, consider which scenes came the easiest to you, which you enjoyed writing the most, which the least, and so on. When you go back to these scenes, review them with both a critical and a nonjudgmental eye. The critical eye should look for which one seems the most enticing to continue to read. As in, which scene makes you want to write a fuller story around it? The nonjudgmental eye should be looking to see if these sound like the same person wrote them or not. Is there a match between the ones you enjoyed writing the most and the ones that sound the best, or between the ones you struggled with and those you like the least? Then do the fun litmus test of having someone you trust who will be honest with you read them. Have them tell you which scene/s they found the most compelling or interesting, and why. If you’re feeling particularly brave or mischievous, don’t tell them you wrote them all; instead, say that this was an exercise given to your online writing group and these are all the different results, and you have to judge which ones are the best. Have them tell you now which one is most compelling and interesting. Why ask for outside help? Because it’s hard to judge our own writing objectively, and what you’re looking for is which genre, POV, and style of writing compels a reader to want to continue on or ask for more. Either your outside reader will recognize you wrote all of them--in which case it may be that you have a clear voice already (or make the exact same spelling, punctuation, syntax or word errors over and over again)--and/or they’ll choose the ones they like the best and tell you why. Once you’ve done this, you’ll have at least written one thing, if not many, out of your standard genre and comfort zone. Once you do, you may be amazed at what you find. Personal note about this? I used to write very serious stuff. It didn’t sell. “Distinct voice, well written” but also “not for us”. A friend begged me to “write funny” for several years until I broke down and gave it a shot. The end result? After years of frustration, my first paid and published pieces were humorous ones, and the novel series that landed me my agent and publishing contract was one I’d never have written if not for trying something completely different (humor and fist person POV combined) than I’d been comfortable with previously. Give it a shot. You have nothing to lose and much to gain. And no words written are ever wasted. 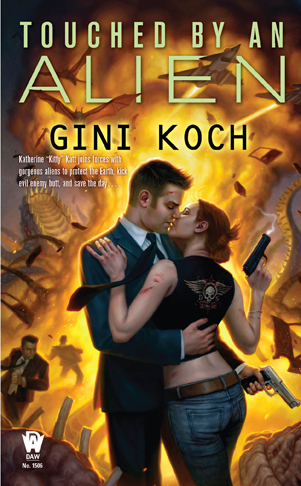 Planning any wedding is hard enough, but Katherine "Kitty" Katt and Jeff Martini have a lot more to worry about than seating arrangements, because multiple interstellar invasions, Alpha Team in mortal peril, and inter-alien conspiracies are all on the guest list--and the gifts they've brought explode. 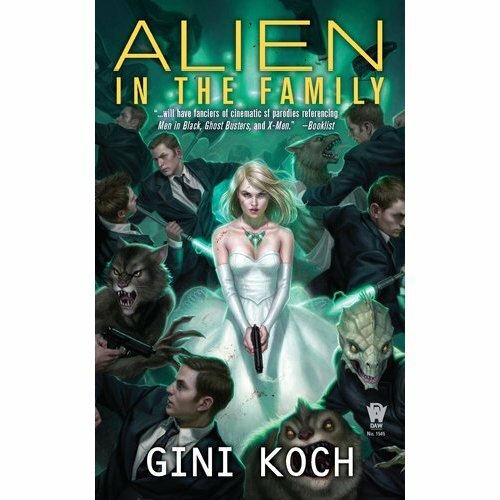 Learn more about Gini and her books at her website. This is a fabulous post about voice! I'm going to have to try this exercise. I'll definitely be trying this, it seems like a great way to figure out the styles/genres you're naturally drawn to and gives you a pressure free way to play with new genres. Now I just need to find a good prompt . . . I'll definitely have to try this. Thank you for the great post! That exercise sounds fun, but I wonder how necessary splitting up your "voices" across pennames really is. I realize fiction and non-fiction are two different arenas, but… I freelance. My clients don't expect me to write in the same "voice" for a technical audience as I do for a general audience. I don't change my name for that. But then, I also tend to have odd series ideas that I'm pretty sure wouldn't be acceptable to publishers. Thanks so much for coming by today, Gini! And with such a great post to boot. Carradee: Gini will have more on this I'm sure, but I don't think it's always necessary. If you write in different genres with different names, it's possible you'll have different voices. A YA voice is quite different from a thriller voice. And changing the voice can help you expand your readership by appealing to different preferences. I think it would depend on what the reasons behind writing in different names was. I thought this was a great post as well! I like the idea of doing several different "takes" on the same scene, to see how differently things crop up. It also forces you to write from a different "intent". I've noticed writing different POV characters in the same book, that when I have the character's intent (snarky, scared, dreamy, etc) in mind, the scene comes out in their voice much easier. Great post -- I'm going to spend my writing time today working on the exercise you suggested. This is a great writing tip--thanks! @Sophia - use the prompt I gave as an example. No reason to work hard. The prompt shouldn't be anything too much of anything...it's your writing that will turn it into "something". @Olivia - you're very welcome! @Carradee - like Janice said, it's only necessary when it's necessary. Fiction is different from nonfiction, too. The best example I can give you is if you write children's and erotica -- you NEED to have a pen name for at least one of those, and your voices had better sound different, too. That's a wide gap, but I use it because it's so clear WHY you'd use a different voice and name for those two. However, if you also write mysteries and science fiction, you may need to sound different and use a different name...or you may not. It's what works for you that matters in the short and long run. For ME, I write in different voices, and I enjoy doing so. @Janice - thanks for having me; always great to be here! @Elizabeth - I agree, though I find that many times MY intent and the characters' intent are NOT the same thing. I go with what the characters want, 99 times out of 100. @Megan - thanks and good luck! @Elle - you're very welcome, and have fun with it! @Bo - thanks! I agree, in that you have to inhabit each character's mind, so you know what their individual motivations are. Every character is the star of their own story, even if they aren't the star of the story you're writing. And comics characters are just as indelible as literary characters (says the comics geek-girl here).